If you’re a 20-something college student or a young professional still paying for college, the phrase “personal finance plan” might sound like pure fantasy. First, you believe, you need to get hold of some finances, and then maybe you can start managing them. But Erin Lowry, a millennial herself, disagrees. And she’s written a smart, fun guide to going, in her words, “from flat broke to financial badass” starting now. Form the habit of saving early and consistently. Learn the truth about building a credit history and score. 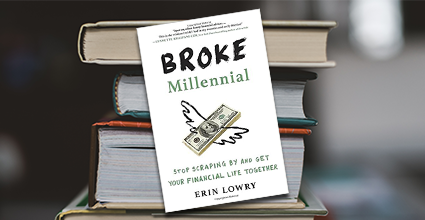 Whether you’re a millennial or a bit older, let Erin Lowry give your finances a “freshman orientation” and graduate to a happier, less stressful life.